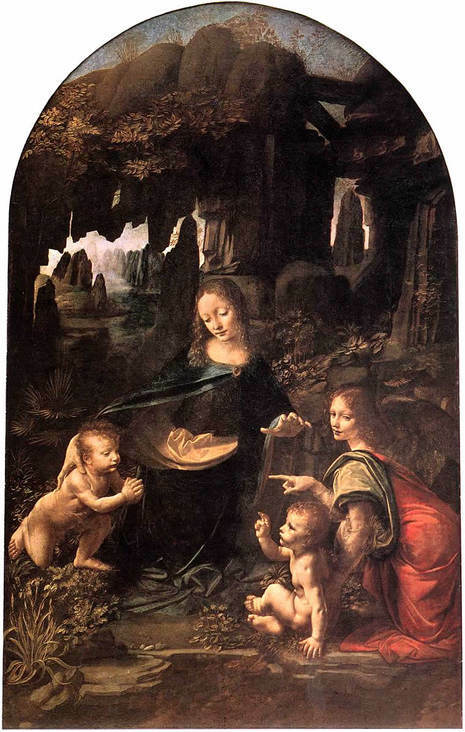 The Virgin of the Rocks (sometimes the Madonna of the Rocks) is the usual title used for both of two different paintings with almost identical compositions, which are at least largely by Leonardo da Vinci. They are in the Louvre, Paris, and the National Gallery, London. This version is in the Louvre, painted around 1483-1486, or earlier. Most authorities agree that the work is very largely by Leonardo, and is the earlier of the two works. The fine brush work and use of chiaroscuro, or contrast between light and dark, are considered characteristic of many of Leonardo's works. It is about 8cm taller than the London version. The first record of this picture is in 1625, when it was in the French royal collection. All the work was to be completed by the Feast of the Conception (December 8) 1483, but this did not happen. At some later date the legal dispute began; the main issue being that the main painting was unfinished, and Leonardo had left Milan. Meanwhile the de Predis brothers had completed their portion of the work, and wanted payment. 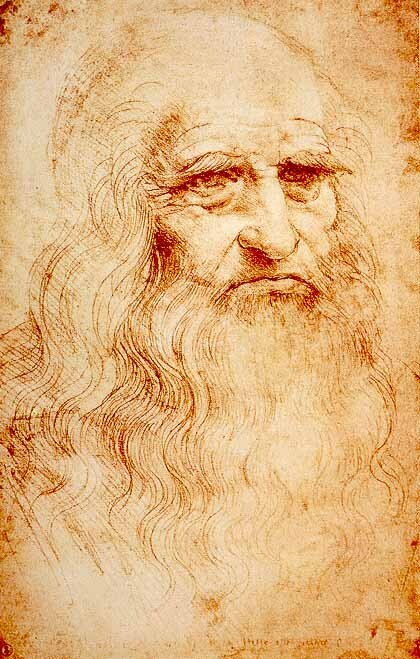 The dispute was settled on April 27, 1506, with the requirement that should Leonardo return to Milan within two years he should complete the painting, and receive further specified sums beyond those in the original contract. This appears to have happened, as a sum was paid to him in 1507. The surviving documentation casts no light on the existence of two versions, nor does it give any support to claims that the clients were unhappy with the subject or treatment of the paintings. At what point the first version was diverted, or if it was at all, remains unclear, and the subject of many theories. On stylistic grounds some writers, including Martin Davies, feel that 1483 is too late a date for the Louvre version; for the commission Leonardo may have simply repeated a composition he had already produced. Alternatively, the Louvre version may have been painted for the confraternity soon after the commission, and then sold to another buyer. The spectacular Grande Galerie in the Louvre plays an important role in the novel The Da Vinci Code, providing the setting for the beginning of the story. Far more remarkable than the parquet flooring with its chevron patterns mentioned in the book is the collection of Italian paintings. Four of the five paintings by Leonardo da Vinci in the Louvre are on display here. The Da Vinci Code analyzes The Virgin of the Rocks (which Sophie Neveu removes from the wall) in a new and subversive way. It suggests that Mary holds in her left hand the invisible head of Mary Magdalene, whose neck is being symbolically sliced by the gesture of the Archangel Uriel on the right. Leonardo was thus supposedly showing the Church’s conspiracy against Christ’s companion during the early centuries. This far-fetched interpretation of the painting might have been inspired by the work of Bernardino Luini just to the left: Salome Receiving the Head of Saint John the Baptist. In reality, Mary’s mysterious gesture relates to traditional religious iconography: Mary is the mother of Jesus, but she is also the incarnation of the Church, the “house.” In the painting, therefore, she seems to be covering the head of her Son with her left hand, as if with a roof. The Da Vinci Code thus transformed a gesture of protection into a metaphorical representation of murder. This powerful literary effect is a travesty of art history.